Even minor burns can be very painful. The first few hours after a minor burn can often be accompanied by an unbearable stinging sensation as well as excess heat produced from the affected area. Once this has cooled down and the initial sting has subsided, you may be fooled into thinking that you are over the worst of it; however, infection is a very real possibility unless care is taken in the following days to disinfect the area and keep it clean. Infection is a major risk with burns. More burn victims die from consequent infections than the burns themselves making sterilization of the area essential. After a burn the skin is often in a very sensitive, fragile state, leaving it hard to apply antibacterial agents that often come in cream form. Luckily, colloidal silver is easier to apply. Silver has been used for its antibacterial properties for hundreds of years and even today we are still finding new health applications for this powerful element. 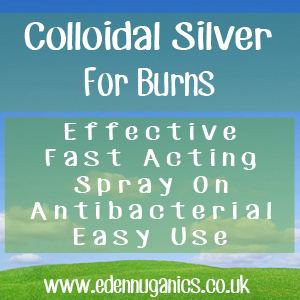 Colloidal Silver is a completely natural antibacterial liquid that can be sprayed or misted over the skin after a burn to help clean and disinfect the area. Before we walk you through what to do there a couple of things that you will need to have to hand. The first is colloidal silver in a spray top bottle. When buying this product it's a good idea to make sure the ionic Silver particles are medical grade with an average particle size of 0.001 microns and that it has a typical overall concentration of 15-20 parts per million (ppm). You will also need a non-stick gauze or a bandage. Make sure to do your research and use a quality colloidal silver product as, sadly, there have been reports of some colloidal silver products containing other substances other than just the silver and distilled water. Obviously on a burn this is the last thing you need when trying to avoid infection and irritation. Immediately after receiving a burn, run cool water over the area for at least 5 - 15 minutes. The skin continues to burn even after the initial incident so running it under cool water stops the burn continuing. This will also alleviate some of the pain and sting as well as help to reduce swelling. Allow the burned area to air dry, then apply a few sprays of colloidal silver directly to the affected area. Cover the affected area with a sterile non-stick gauze or bandage. It must be non-stick, this is vital when covering burns. Repeat these steps around 4 times a day, more for more severe burns. Does Colloidal Silver Work for Sunburn? Colloidal silver is suitable for treating any minor to medium burn. (Severe burns should be monitored by a medic in a sterile environment). However, sunburn has far less chance of becoming infected than other forms of burns. Fact: Researchers have found colloidal silver to be effective against hundreds of types of known microbes. Manuka honey - Manuka honey is a highly nutritious food that possesses a wide range of health benefits including powerful antibacterial and antiviral properties. Naturally occurring hydrogen peroxide is another component of this unique form of honey (only produced in New Zealand) giving the honey its almost antibiotic qualities. Oatmeal - Oatmeal is another age old remedy for burnt skin, this versatile grain is not only delicious to eat, but is known to sooth the skin and offer relief from irritation like eczema and burns. To use oatmeal put the oatmeal into gauze or a clean sock if you don't have gauze and tie a knot in the end. Wet the end with the oatmeal and start to squeeze and manipulate the oatmeal inside the gauze/sock until a milkly substance comes through. Pat gently and then hold on the affected area. Make sure to never rupture any blisters that have formed as a result of a burn. Rupturing blisters can easily lead to infection as well as scarring. The blister is natures way of protecting the skin and will eventually go away on its own. What is it about silver that helps heal burns?